Family Guy has seen better days. Any passion from the show has seemed to dissipate, and now it just seems we’re going through the motions. While the production style of South Park keeps the show fresher than anything else on television, Family Guy seems to suffer with the relevance of it’s jokes. They made a joke recently about their audience being teenagers. Perhaps this rings true, maybe they should the jokes more relevant for younger audiences and reference less things from before the year 2000. Make sure you comment some ways you think Family Guy can turn things around. But alas, that isn’t really why you’re here. So let’s not waste anymore time and get this review started. 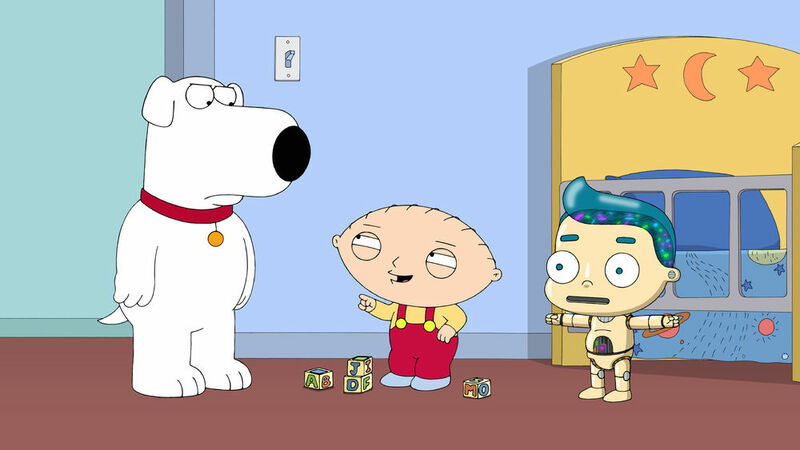 In “Guy Robot” Stewie builds a robot friend after a fight with Brian and Lois makes Peter buy a new mattress. Despite what I said in the intro, I do think this is an upswing for this season. If you read my previous two reviews, you know I haven’t been having a good time with this season. Guy Robot certainly brought the strengths of Family Guy to the forefront though. Every character involved was on full display, playing an important role. Brian was an egocentric selfish douche, Stewie was inventive, Peter had a wacky quest with his pals. It was all very reflective of what makes us like each one of these characters. The jokes were strong, the stories felt unique and fresh, although Stewie’s reminded me a lot of the movie “Her”. The introduction of Stewie’s Robot friend also helped address the stagnating cast, if only for a little while. There were also fourth wall breaking jokes about The Simpsons as well one about the various H.Jon Benjamin characters, both were done well. On the flip side, the episode sort of offered us more of the same. Thankfully it was some of the stuff I like seeing from the show, but I desperately need something new. I’ve mentioned a cast refreshment before, but how about the Griffins relocate to a different place for a season? Change up the dynamic of the show a bit. Archer tossed away the spy premise for an entire season, just in the name of keeping the show fresh. Family Guy has somehow made it fourteen seasons with only slight changes. We need to shake things up, because there are only so many moves you can make with the same pieces. In regards to the episode, I think it was good for what it was. It was another Brian and Stewie story was a deviation, it was another episode of Peter and the guys having misadventures. I thought they were well done, but it feels familiar. It sort of feels like I’ve seen this. Overall, I enjoyed the episode. I thought it brought some funny stuff to the table and the stories were interesting to see unfold. It was lacking in the creativity department, but it was really as good as a rehash can be. It seems Family Guy will be taking a week off next week, but in two weeks we’ll be checking out “Peternormal Activity”. A Halloween episode I’m very excited to see. I’m satisfied this week, hopefully they can build off this smidgen of momentum. What did you think of “Guy Robot”? Like it? Hate it? Be sure to let us know!